Every year, we receive always the same questions, so we decided to answer here the more common to answer you doubts. What is the date for Tap On Barcelona 2019? How can I aply to the courses or events? What will happen if I register and cannot attend Tap On Barcelona Festival? How can I participate in the Cutting Contest? Can I change the course if after taking the class is not my level or I don't like it? Can I apply or cancel some course during the week of the Festival? Where will be the classes? Tap On Barcelona 2019 will be cellebrated (as usual) the last full week of July, that this year is: July, 22th-28th. By the end of April, whe we have the teachers and schedule defined, we will publish a registration form where you can access from the menu in a tab called "Registration". In this page, you have to fill the form with your personal data and you could choose the courses, parties and performances you want to attend. During this process, you could see all the time the prices and the courses you are registering. After you send your registration, you will receive an automatic email confirming that te registration is correct. Some days later (let us to check all the information), you will receive a Confirmation mail where you will find some advices, conditions of registration and payment rules (via paypal or bank transfer). Registration will be confirmed after the payment of the total amount. Every year, we offer a 10% Discount for students who Registrer and Pay before May, 15th. If you register before this data, you could see the prices with this discount in our website. But be aware, because the registration with discount is ONLY valid if you pay before this date. Remember: You will only have the discount if you pay before May, 15th. You have to be registered in 3 or more Courses of Intermediate or Advanced. You have to Fill-Up the Scholarship Form (It will ask you the Registration Number, so you have to register first). At the beginning of the week, we will give the list to the teachers in order to choose the best student in each level, and at the end of the week, we decide who will win the scholarship for next year. THERE IS A NON-RE-INTEGRABLE TUITION FEE of 75 € included in the registration price. Students can cancel their bookings until July 10th (Except the tuition fee of € 75). From that day (July, 10th), the amount paid will not be refunded, but the registration paid could be used the following year of Tap On Barcelona by the enrolled person. During the week of Tap On Barcelona, you can speak to the organization. We will give you the pertinent information and perform the necessary tests or previous phases if you consider it timely. Once you have all the information, if you are interested, you can register to participate in the Cutting Contest. Changes of schedules, classes, courses, etc. are allowed ONLY on Monday, the first day of the Festival. From the first day, no changes in courses or schedules will be allowed. Due to the high demand in the last years of the courses of Tap On Barcelona. You can only sign up DURING the week to a course if there are available places in that course. Also, you can only unsubscribe in a course only if you find someone interested in covering that place you leave available. Otherwise, you will not be able to unsubscribe. The classes and masterclasses of the Tap On Bacelona will be realized in the Study of Dance Luthier. 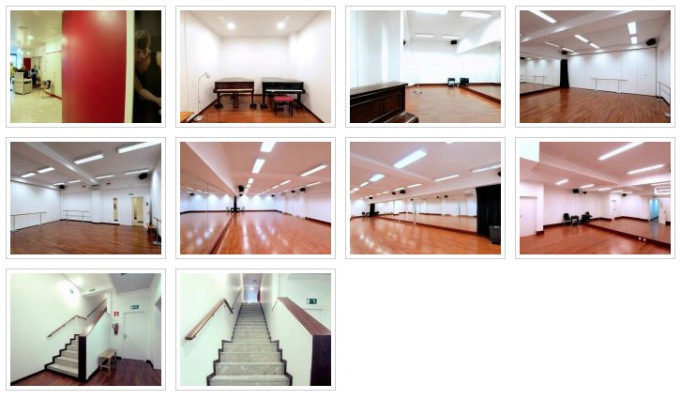 Luthier Dansa is a space of 800 m2 distributed over two floors. All classrooms are equipped with mirrors and high quality floating parquet. Apart from conventional classrooms, the school has two large rooms: one of 140 m2 and another of 125 m2, where activities such as masterclasses, dance parties or performances will take place. The school has changing rooms, elevator and washbasin adapted for physically handicapped. In addition, it will house a small shop of restored pianos.